A victim of the Holocaust. Fought in the US Army. 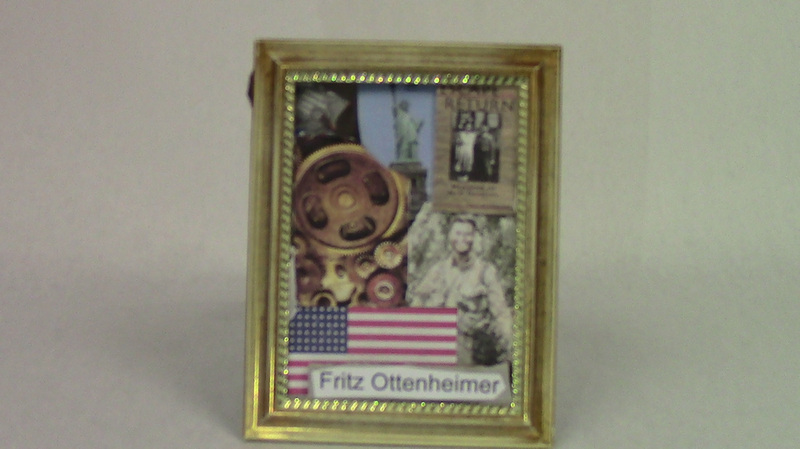 This shadow box is about Fritz Ottenheimer's entire life. In the top left corner of the shadow box you see Nazi Germany because Mr. Ottenheimer was in Germany as a child and left Germany when he was fourteen. Next to the map of Germany is the Statue of LIberty because after the Ottenheimer's left Germany they moved to America. In the bottom right hand corner there is a picture of an American soldier because once Fritz Ottenheimer graduated from high school he went into the U.S. army and was a soldier. After the war he was a mechanical engineer which is represented by the picture of the gears. In 1999 he published his book Escape and Return, in the top right hand corner is a picture of his book. One morning in Germany Fritz Ottenheimer was transporting a group of Nazis to a prison. His job was to watch the prisoners to make sure none of them tried to escape. Fritz was sitting on top of the truck when he heard the prisoners start to yell at him. He didn't know what they were saying but ducked down, and when he got up he saw there was a hanging piece of wire that would have killed him. It was very surprising to see that a Nazi actually saved his life. During World War II, Fritz Ottenheimer, who escaped from Germany in order to avoid Hitler and his army, was a United States citizen, and he went back to France as a translator in the United States Army. Fritz Ottenheimer was a great help to the Army because he spoke English, German, and French. While he was in Germany, he passed by his old home and his father’s old clothing store. He even knew some of the people in the town because he went to elementary school with them. Fritz tried to help them by giving them supplies if they needed help. Fritz Ottenheimer was born in Germany in 1925. Fritz was eight years old when Adolf Hitler came to power and lived in Germany when Hitler was beginning his rule. He was in Germany when the Nazi party started making rules that affected the Jewish people. In 1936, the Ottenheimers moved to America. Fritz Ottenheimer had relatives in America who sponsored them and helped his family get their visas. He was fourteen years old when he left Germany. Once Fritz Ottenheimer graduated from high school, he enlisted in the United States Army. Fritz Ottenheimer entered the Army during the end of the war and was part of the last drive into Germany. Fritz Ottenheimer became a rifleman for the United States Army on February 3, 1944. He was mainly a translator because he was fluent in three different languages. Fritz Ottenheimer served in the military for four years. He went into the army in 1944, and after the war went back to the United States. When he was back in the United States, he finished his education and became a mechanical engineer until he retired in 1987. In 1999 Fritz Ottenheimer wrote Escape and Return. Since the first publication of his book, Fritz Ottenheimer has been talking about his experiences with students who are interested in learning about the Holocaust. Overall the Holocaust had a huge effect on Fritz Ottenheimer’s life. The Holocaust was the reason he moved to the United States and the reason he joined the army. Fritz Ottenheimer is still alive today and enjoys sharing his stories with students.